The high-quality SLR Magic 25mm T0.95 HyperPrime CINE III lens is designed exclusively for Micro Four Thirds-mount cameras. Aimed at videographers, it features smooth decoupled aperture control, and integrated gearing on the focus ring for attaching a follow-focus system. 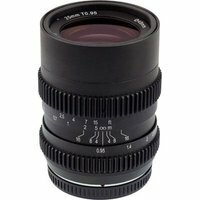 Its super-fast T0.95 aperture makes it ideal for low-light work, or applications that require a shallow depth of field.